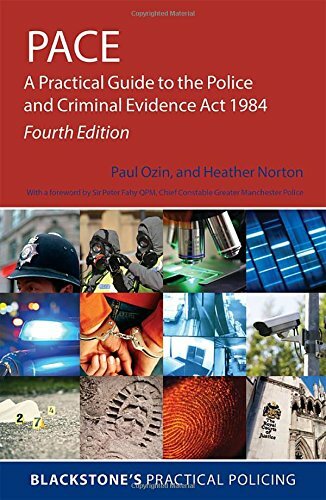 9780198743309 | 4th edition (Oxford Univ Pr, January 12, 2016), cover price $67.50 | About this edition: Providing practical guidance on what remains the single most important statutory basis for police duties and powers in England and Wales - the Police and Criminal Evidence Act 1984 and its Codes of Practice - this is an essential reference source which the busy police officer or legal practitioner cannot afford to be without. 9780199681853 | 3 edition (Oxford Univ Pr, January 14, 2014), cover price $75.00 | About this edition: This book provides practical guidance on what remains the single most important statutory basis for police duties and powers in England and Wales, the Police and Criminal Evidence Act 1984 and its Codes of Practice. 9780199595242 | 2 edition (Oxford Univ Pr, March 15, 2011), cover price $60.00 | About this edition: This book provides practical guidance on what remains the single most important statutory basis for police duties and powers in England and Wales, the Police and Criminal Evidence Act 1984 and its Codes of Practice. 9780199289233 | Blackstone Pr, December 21, 2006, cover price $70.00 | About this edition: This book provides practical guidance on what remains the single most important statutory basis for police duties and powers in England and Wales, the Police and Criminal Evidence Act 1984 and its Codes of Practice.